Mmm, sounds delicious. I've stopped buying industrial pre-made pastry because I've gone off the taste. I've gone back to making my own pastry again (using butter) and so each pie is divine. Actually, I use unsalted butter and add salt crystals which seem to stay whole and give a lovely crunchy salty texture/taste. God it's good! There's just no substitute for a home-made shortcrust pastry. What a great idea! All the Cornish pasty goodness in one big pie. I'm not sure I'm qualified to discuss whether you're allowed to call it Cornish pasty pie, not being remotely Cornish, but it seems to me to be the perfect name - explaining exactly what it is in three little words! Firstly, great that you are back blogging Fiona. Secondly, I agree with Nora, Cornish Pasty Pie does what it says on the (pie) tin. Lovely recipe. 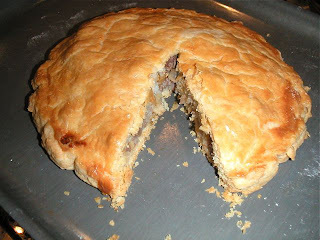 I've made something similar to this but with pastry underneath too and as a big flat circular pie on a baking sheet, with the top piece of pastry crimped to the bottom - you can feed a lot with it, and it is great for the lads watching rugby or F1 on the telly to just plonk it in front of them with loads of napkins and a big knife to cut off what they want. looks heaven. .This looks like such a simple, quick recipe, ill have to try it soon! simple recipe and sounds delicious! 100% going to try it out this week. Thanks. . .